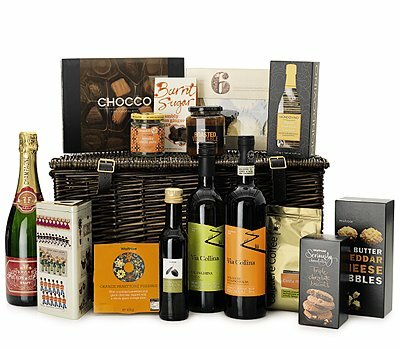 All of the traditional festive favourites come together in this beautiful hamper. Filled generously with scrumptious mince pies, chutneys, fruitcake and red wine. 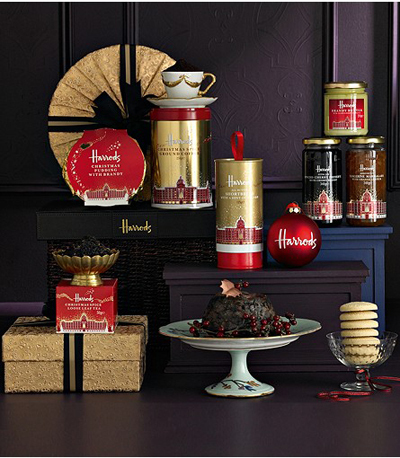 The hamper is presented in a delightful old-fashioned basket along with 4 festive ‘Noel’ candle holders. 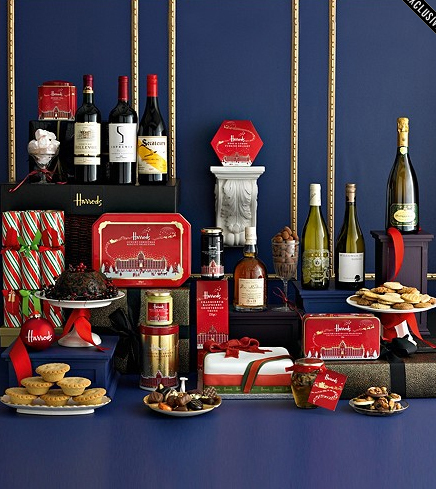 A festive hamper full of indulgent treats-from fine champagne to orange panettone Christmas pudding.  A thoughtful collection of home comforts that will make the perfect Christmas. The festive treats include Fortnum’s Christmas chutney, cranberry sauce, some mulled wine spices and a St James Christmas pudding. 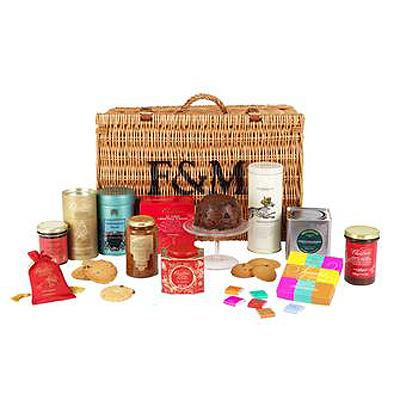 Not forgetting as well Fortnum’s tea and coffee, chocolate squares, shortbread and two kinds of marmalade. Your Christmas feast waits. 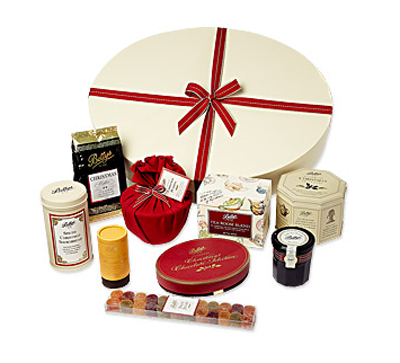 Rose petal jelly and extra virgin olive oil, non pareil marmalade and red pepper tapenade, Darjeeling tea and very delicious Christmas pudding are just a few of the delicacies to be found in this outstanding hamper. 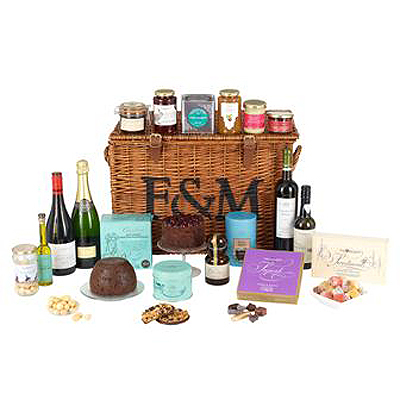 Christmas in a basket, this gourmet hamper is brimming with festive favours, liqueur-infused preserves, rich brandy butter and two spiced beverages. Presented in a sea grass basket with leather style lid. With Cocoa-dusted almonds, cranberry minced pies, a five year old Caribbean rum aged for a further 3 years in sherry casks and two spicy winter drinks, The Eaton brings plenty of excitement and warmth to Christmas. All the Christmas essentials in a superb seasonal selection . 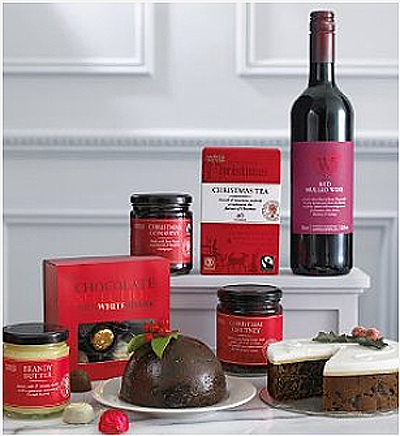 A gorgeous gift it contains a classic red mulled wine, brandy butter, Christmas pudding, Christmas chutney and a classic top-iced Christmas cake. 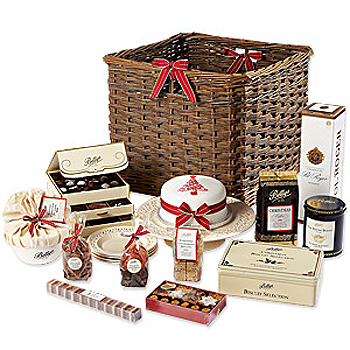 A hamper loaded with luxurious Christmas fare. 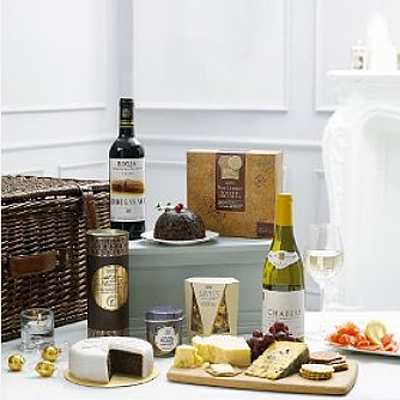 Cornish cove cheddar, Blacksticks blue, Scottish Lochmuir Oak smoked salmon, delicious fig and balsamic vinegar chutney finished off with a sumptuous Christmas pudding, Christmas cake, all butter shortbread and luxurious Swiss milk chocolate truffles. Full of festive magic, this box contains a Christmas cake in a pretty keepsake tin, one of our rich Christmas puddings, delicious handmade preserve, a selection of biscuits and confectionery and the finest Betty’s tea and coffee. 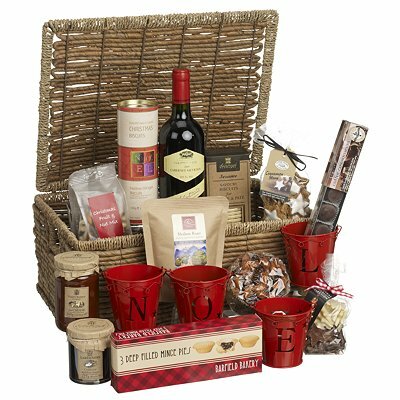 Toast Christmas around a roaring fire with this sumptuous hamper containing everything you need for an unforgettable Yule party. Includes, cake stand, four side plates, Christmas tree cake, biscuit selection, tea and coffee, Christmas pudding, imperial chocolate selection box, Pol Rodger Champagne, petites fours….and more!